The Detroit Red Wings have signed defenceman Danny DeKeyser to a six-year contract worth a reported $30 million. The deal avoids arbitration between the team and player, as the hearing was scheduled for July 28. Many observers of the Red Wings argue that DeKeyser is the cornerstone of the franchise on the blueline and that’s certainly true, especially as the club has struggled to solidify an identity in the post-Lidstrom years. The 26-year-old Detroit native slots in ahead of Mike Green and Niklas Kronwall on the depth chart and he’s averaged over 21 minutes of ice time a game, with the puck-moving acumen and mobility to lead the pack. While he has some work to do in terms of getting his point shots through, there’s a lot to like about DeKeyser and this signing. For one, avoiding arbitration is almost always a good thing. The deal shows the Red Wings are willing to give him some term and some dollars. General manager Ken Holland reported on Monday that DeKeyser and Detroit weren’t far apart in contract talks, with both parties interested in a long-term deal. DeKeyser is coming off a two-year contract worth an annual cap hit of $2.187 million, so this is a pretty nice raise. Despite his lack of offensive prowess, the blueliner was the team’s most effective rearguard in the 2015-2016 season. He put up 20 points in 78 games, including eight goals. Three of his goals were game-winners. In five playoff games, he managed a single assist and five shots on goal. 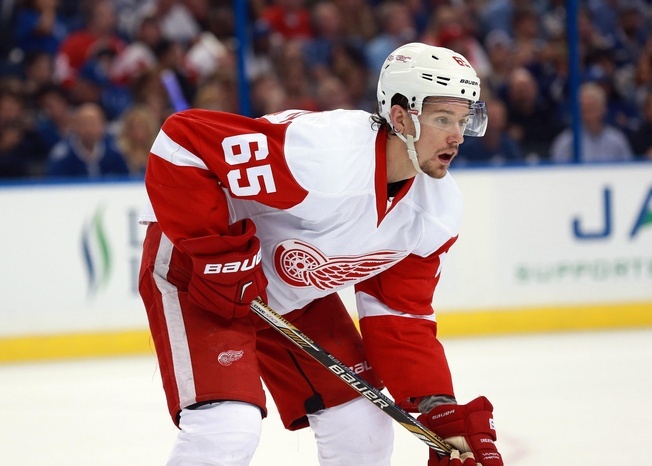 DeKeyser was signed by the Red Wings as an undrafted free agent out of Western Michigan. He hopped to the main roster without any AHL conditioning, but he was a part of the 2013 Calder Cup run in Grand Rapids. The next goal for Detroit is to line up goalie Petr Mrazek, as his arbitration hearing is set for Wednesday. According to reports, the Red Wings are asking to pony up about $2.7 million for the first season and $3.15 million for the season after that. Mrazek is asking for $5 million a season, so there’s not a lot of wiggle room. The team filed for arbitration with the netminder, too, so that means Mrazek can go with a one-year or two-year award when the offer comes. Right now, things aren’t looking good in terms of avoiding arbitration and it looks like the franchise will head for their first case since Ray Sheppard in 1995 – not counting the whole Jiri Hudler mess.